Meropenem stands out as an antibiotic to be used first in ESBL and MDR infections, given its efficacy profile and safety record (see earlier blog). It also would seem to be appropriate to use relatively high doses or prolonged infusion times – or both – to improve T>MIC for the short-half-life drug before resorting to combination therapy. However, given the history of drug-induced seizures with imipenem, a drug in the same class, clinicians might be reluctant to go the route of higher doses with any penem, but such concerns could be unfounded. Imipenem has been shown to, actually, have far greater epileptogenic potential when compared with other penem antibiotics . 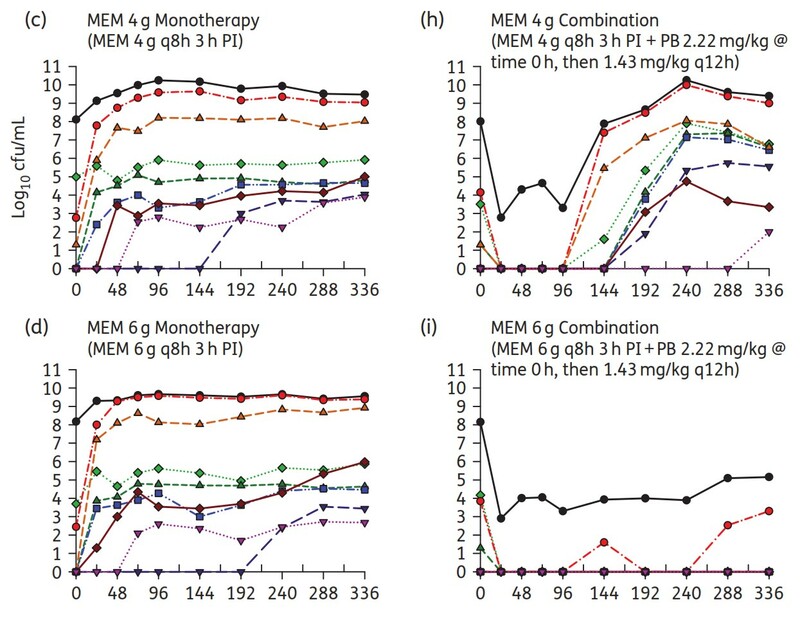 The standard dose for meropenem/Merrem  is 500 mg – 1 g IV q8h; hence the maximum daily dose is lower than for imipenem/Primaxin which can be dosed up to 1 g IV q6h. So, there could, indeed, be potential for higher doses of meropenem to maximize efficacy, all the while staying on safe ground. Today’s blog is bringing to your attention the findings of 2 recent publications that explore just such higher doses of meropenem for eradicating some notoriously difficult-to-treat bugs, carbapenem-resistant K. pneumoniae (CRKP) and Acinetobacter baumannii (CRAB). Using TDM to optimize meropenem levels, Pea et al. studied a group of patients receiving a continuous infusion for KPC infections, half of which were meropenem-resistant. Daily doses of meropenem employed were as high as 13 g/day with the average daily dose in the 5-6 g/day range. On univariate analysis, steady-state blood concentrations (Css)/MIC ratios >1 or 4 g/L were associated with successful clinical outcomes, including CRE infections. No safety issues were observed in this retrospective study despite such high dose levels. As in many studies of this nature, it is difficult to ascertain the contribution of dose modification in the presence of other antibiotics that were co-administered. Synergistic effects with tigecycline or colistin may have played a role, but given the small sample size of 30 patients and the lack of randomization, such synergy would be difficult to prove. A recent in-vitro study explored the effect of colistin on the meropenem MIC for CRAB. Acinetobacter is a very tough MDR pathogen due to a wide array of resistance mechanisms. There are few antibiotics one can employ with reasonable chance of success; our options are limited to meropenem, aminoglycosides, colistin, and tigecycline and possibly sulbactam combined with a β-lactam. Many of these drugs are problematic due to toxicity. In a surveillance study of US isolates, a 95% susceptibility was only seen with polymyxin; none of the other antibiotics had a better than in 50 – 60% chance (by MIC criteria) to work against the pathogen . It stands to reason that the situation has not improved in the past 6 years since these isolates were tested. Treatment with combinations of antibiotics is often, therefore, necessary and advisable. Lenhard and his group were able to show that meropenem MICs dropped for CRAB into the susceptible range when the penem was combined with a fixed dose of colistin. Higher meropenem doses achieved faster, more pronounced and more durable killing effects even in strains with MICs as high as 64 mg/L. Indeed, the dose of meropenem required to overcome carbapenem-resistance in these experiment was very high – 6 to 8 g q8h per day. The authors noted that lower doses were only partially effective and actually selected for meropenem resistance. However, these experiments were conducted with very high baseline CFU counts (108/mL) unlike the traditionally used CFU test conditions for broth microdilution tests that are usually much lower (approx. 105/mL). We would argue that the test conditions selected may have created tougher conditions than one would expect in the clinical world. Nonetheless, this experimental set-up provided evidence of resistant subpopulations that may not have been noticed otherwise. So, if high-dose combination therapy is becoming the way to go for CRKP and CRAB, how is biotech responding to the challenge? There are NCEs, BL/BLI combinations, and other novel approaches. Spero Therapeutics is developing its “potentiator platform” drug SPR-741 that just entered clinical development. Well, it is notable that SPR-741 is a polymyxin derivative  which acts on bacterial cell walls just as polymyxin and – in the process – may give partnered antibiotics access to otherwise unreachable intracellular targets. Unlike polymyxin, SPR-741 has little to no intrinsic antibacterial activity. Let’s see whether it lacks polymyxins’s renal toxicity as Spero claims. This entry was posted in Recent Literature, The News, The Viewpoint and tagged acinetobacter, aminoglycoside, antibiotic blog, antibiotic synergy, BL/BLI combination, carbapenem-resistant Klebsiella, colistin, CRAB, CRKP, Doribax, doripenem, Harald Reinhart, imipenem, imipenem side effect, meropenem, Merrem, penems and seizure, PK/PD modelling, polymyxin B, Primaxin, prolonged infusion, renal toxicity, Spero Therapeutics, SPR-741, T>MIC, tigecycline, Tygacil, VABP by Harald. Bookmark the permalink.